The spatial distribution of plant isotopes in urban areas provides information about pollutants and their effects on plant physiology. The radiocarbon content of plants in urban areas reflects uptake of fossil fuel derived CO2, since fossil fuels contain no radiocarbon by virtue of their age. The stable carbon isotope composition of plants reflects both pollutant uptake as well as the physiological effects of pollution on plant gas exchange. By mapping these isotopes, we can obtain information about the spatial distribution of CO2 and other pollutants in cities. 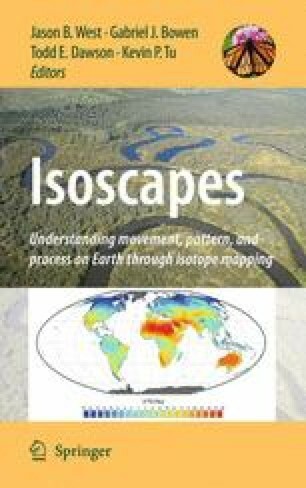 While this method has not yet been widely used in urban ecology and geography, we discuss the basis for interpreting isoscapes of stable carbon and radiocarbon isotopes, and review the studies that have been conducted to date. Plant carbon isoscapes clearly have great potential for studies of pollutant distributions and greenhouse gases in cities, and may be used as integrated pollution and CO2 proxies. This work was supported by U.S. National Science Foundation grant 0620176. We thank Dachun Zhang, Greg Cane, and Xiaomei Xu for their assistance in the laboratory and Kristine Adan and Neeta Bijoor for their assistance in the field.